Check out our pictures from Pompey’s 2-0 win against Southend at Fratton Park. A Michael Turner own goal and a Jamal Lowe header handed the Blues victory. 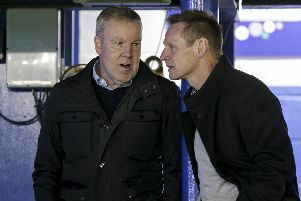 Kenny Jackett’s side now sit six points clear at the top of the League One table after Sunderland’s game at Accrington was abandoned at half-time because of a waterlogged pitch.